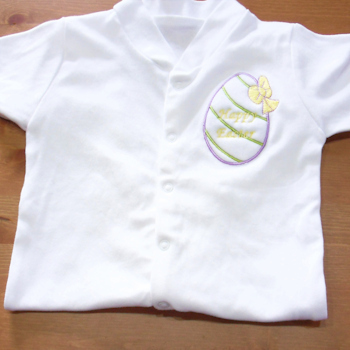 Cotton babygrow sleepsuit with custom Easter Egg applique embroidery and personalised name. Cotton babygrow sleepsuit with custom Easter Egg applique embroidery and personalised name. Personalised white cotton baby grow gift for baby that can be tailor made with a name or word of your choice (our example reads Happy Easter, you can have a name in place of this.) Long sleeved with poppers down the front and around the crotch for simple changing. Adorable sleepsuit for baby girls and boys for Easter and springtime wear. Size: Newborn (First Size), 0-3 Months, 3-6 Months, 6-12 Months, 12-18 Months.